We are leading manufacturer and supplier of Sandstone cobbles from Rajasthan, India. Our Range of sandstone cobbles are includes of Kandla grey Sandstone cobbles, Autumn Brown Sandstone Cobbles, Raj Green Sandstone Cobbles,Chocolate sandstone cobbles, Buff Sandstone cobbles,White sandstone cobbles, Raveena Sandstone cobbles, Modak Sandstone cobbles, Mint sandstone cobbles etc. Our organization has successfully expanded its business in market owing to the offered elevated quality array of Brown Sandstone Cobbles. Our offered sandstone cobbles are made available to our valuable clients in various color, sizes and specifications. Tested by our professionals, these sandstone cobbles are widely demanded in the market. Apart from this, these sandstone cobbles are utilized in restaurants, hotels and shopping malls. Our Range of sandstone cobbles are includes of Kandla grey Sandstone cobbles, Autumn Brown Sandstone Cobbles, Raj Green Sandstone Cobbles,Chocolate sandstone cobbles, Buff Sandstone cobbles,White sandstone cobbles, Raveena Sandstone cobbles, Modak Sandstone cobbles, Mint sandstone cobbles etc. We provides the installation facility for the sandstone cobbles supplied by us. Standard sizes 10x10x8 cm/4x4x3 inch 14x14x6 cm/5x5x2 inch 14x14x8 cm/5x5x3 inch 14x20x8 cm/5x8x3 inch 20x10x8 cm/8x4x3 inch Finishes All sides natural (hand dressed) Top surface can be honed & flamed Forms Hand cut & machine cut Standard thickness 6- 8 cm/2- 3 inch Note-The price given is applicable for thickness 1.5-2inches. 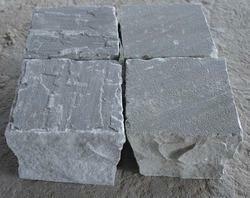 We are leading preparer and of Sandstone cobbles from Rajasthan, India. Our Range of sandstone cobbles are includes of Kandla grey Sandstone cobbles, Autumn Brown Sandstone Cobbles, Raj Green Sandstone Cobbles,Chocolate sandstone cobbles, Buff Sandstone cobbles,White sandstone cobbles, Raveena Sandstone cobbles, Modak Sandstone cobbles, Mint sandstone cobbles etc. 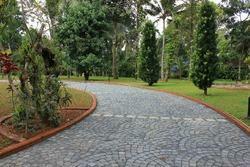 We also provide the installation facility for sandstone cobble supplied by us. 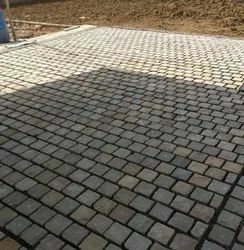 We are leading manufacturer and supplier of sandstone cobbles for Driveway. Sandstone Cobbles for Driveway are available with various colors and sizes, we provide customized sizes and finishes for cobbles. We usually do tumbling to give smooth finish to cobbles. We provide the installation facility for the sandstone cobbles supplied by us. 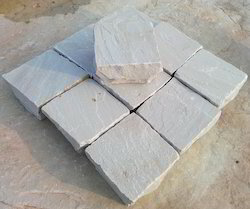 We are leading manufacturer and supplier of white sandstone cobbles from Rajasthan. We offers these white sandstone cobbles with various sizes and thickness as per customer's requirements. We also provide the installation facility for the sandstone cobbles supplied by us. These white sandstone cobbles could be use for Outdoor flooring such as Pathway Paving, Driveway Paving, Street Paving, Making roads for Public Gardens etc. We are leading manufacturer and supplier of Brown Sandstone Cobbles from Rajasthan. We offers installationfacility for sandstone cobbles supplied by us. These Brown sandstone cobbles are available at very competitive prices. We offers customised sizes and thickness in Brown sandstone cobbles. We are leading manufacturer and supplier of Golden Brown Sandstone Cobbles from Rajasthan. We offers installation facility for sandstone cobbles supplied by us. These Golden Brown sandstone cobbles are available at very competitive prices to compare with market because we precure the raw material direct from quarries at lowest price. We offers customised sizes and thickness in Golden Brown sandstone cobbles. 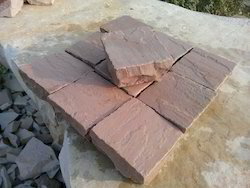 We are leading manufacturer and supplier of Mandana Red sandstone cobbles from Rajasthan. We offers installation facility for sandstone cobbles supplied by us. 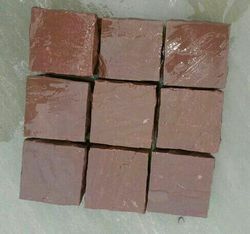 These Mandana Red sandstone cobbles are available at very competitive prices to compare with market beacuse we precure the raw material direct from quarries at lowest price. We offers customised sizes and thickness in Mandana Red sandstone cobbles. Indian Sandstone cobbles are highly popular in European market for pathway and Driveway Paving. We have popular color in Indian Sandstone cobbles are as Kandla Grey Sandstone cobbles, Autumn Brown Sandstone cobbles, Rajgreen Sandstone cobbles and Multicolored Sandstone cobbles. There are various sizes available for customers are as 10x10,10x20,14x14,14x20,20x20cm. 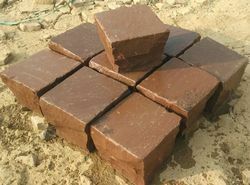 We are leading manufacturer and supplier of chocolate sandstone cobbles. Chocolate sandstone cobbles are highly recommended for commercial projects. 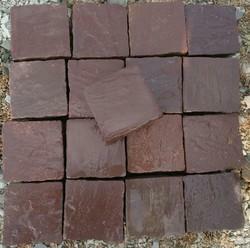 Chocolate sandstone cobbles are used for Roads, Pathways, Driveways, Paving areas for bungalows. We provides the in stallation facility for sandstone cobbles supplied by us. 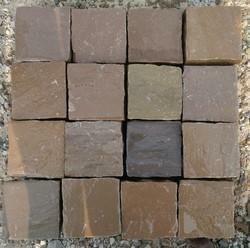 We are leading manufacturer and supplier of Mix Brown Sandstone Cobbles from Rajasthan India. Mix Brown Sandstone cobbles are available at wholesale prices beacouse of its heavy stock at our factory every time because of its enourmous availability. We provides installation facility for the sandstone cobbles supplied by us. Standard sizes: 10x10x8 cm/4x4x3 inch 14x14x6 cm/5x5x2 inch 14x14x8 cm/5x5x3 inch 14x20x8 cm/5x8x3 inch 20x10x8 cm/8x4x3 inch Finishes: All sides natural (hand dressed) Top surface can be honed & flamed Forms: Hand cut & machine cut Standard thickness: 6- 8 cm/2- 3 inch Note-The price given is applicable for thickness 1.5-2inches. We are leading manufacturer and supplier of pink sandstone cobbles from Bijolia, Rajasthan. We supply these Cobbles at wholesale price for our valuable customers. We also offers the installation services. These pink sandstone cobbles could be use for pathways, driways and roads. We also provide the installation facility for sandstone cobbles supplied by us. 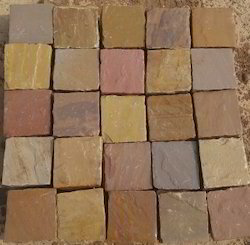 We are leading manufacturer and supplier of Multicolored sandstone cobbles from Rajasthan. We offers installation facility for sandstone cobbles supplied by us. These multicolored sandstone cobbles are available at very competitive prices to compare with market beacuse we precure the raw material direct from quarries at lowest price. We offers customised sizes and thickness in Multicolored sandstone cobbles. 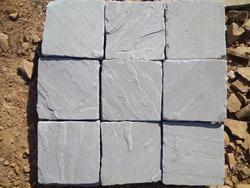 We are leading manufacturer and supplier of Kandla grey sandstone cobbles from Rajasthan. We offers installation facility for sandstone cobbles supplied by us. These Kandla Grey sandstone cobbles are available at very competitive prices to compare with market beacuse we precure the raw material direct from quarries at lowest price. We offers customised sizes and thickness in Kandla grey sandstone cobbles. We are leading manufacturer and supplier of kandla grey sandstone slabs with tumbled finish for indoor as welk as outdoor paving. We offer these tumbled cobble stones for pathway, driveways, car porch and outdoor b flooring for any hotels, villas etc.